Bangladesh has been ranked the fastest growing country with an increasing number of rich populations in the world. Rich people are becoming richer, according to a report by the WEALTH-X. The US-based WEALTH-X provides intelligence and market research on the Ultra High Net Worth (UHNW) and the High Net Worth (HNW) individuals. According to the World Ultra Wealth Report 2018 released on September 5, the UHNW population in Bangladesh is now growing at the rate of 17.3 percent. rapid urbanization, infrastructure investment and manufacturing growth," said the report. The new report reveals that the combined net worth of the UHNW population globally increased by 16.3 pc to US$31.5 trillion last year. 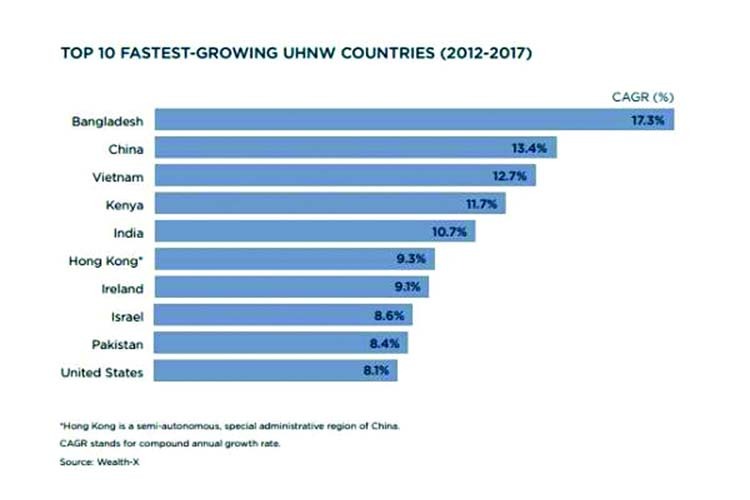 Among the top 10 fastest-growing UHNW countries within the years of 2012-2017, China grabs the second position with 13.4 pc in the race of the rich followed by Vietnam 12.7pc, Kenya 11.7pc, India 10.7pc, Hong Kong 9.3pc, Ireland 9.1pc, Israel 8.6pc, Pakistan 8.4pc and United States 8.1pc. The global ultra wealthy population comprised people each with a net worth above $30 million. The ultra wealthy global population expanded strongly in 2017, rising by 12.9pc to 255,810 individuals. This was a sharp acceleration from growth of 3.5pc in 2016, reflecting significantly more favourable conditions for wealth creation, despite still volatile geopolitics, the report observed. Wealth creation in 2017 was most prevalent in Asia, with its ultra wealthy population expanding by 18.5pc and its collective net worth surging by almost 27pc. The region's share of the global ultra wealthy population rose to 26.5pc, up from around 18pc a decade ago, driven by developments in the large and vibrant economies of China, Hong Kong and India, which each registered an increase in wealth of more than 30pc, added the report. Latin America and the Caribbean enjoyed a strong bounce-back in their ultra wealthy population and combined wealth after a dismal 2016, and there were also impressive double-digit gains in the Pacific and Europe. The world's largest wealth hub 'North America' recorded a solid rise in UHNW individuals and total net worth but growth was moderately weaker than the global average. Wealth creation was relatively subdued in Africa and in the Middle East, although this was still a clear improvement for both regions compared with developments in 2016. The United States has been ranked as the country with the highest Ultra High Net Worth (UHNW) population of 79,595 in 2017, followed by Japan, China, Germany, Canada, France, Hong Kong, United Kingdom, Switzerland, and Italy in the top 10, the report revealed. The UK was the only country in the top 10 to lose ground in the rankings, it added.